Jeremy Puskas, owner and creator of BoneFire Gear, contacted me a few months ago to take a look at his new offering: a self-insulated, fast-pitch hammock. The hammock Jeremy sent me was a prototype that I was able to review for a few weeks before returning. I’d like to thank Jeremy for letting me have this early, first-hand look at his creation. Some of my observations are restricted to the prototype I tested. I know that Jeremy is making changes to the final design so please consider this review a “first look” only. The BoneFire Gear 30° Insulated Hammock is one of a few insulated hammocks coming to market that features a sewn-in insulation, integrating the hammock and under quilt into a single system. The under quilt provides 3/4 to full-ength coverage, depending on how you hang the hammock (see tips below). The under quilt is wrapped on an asymmetric line to match the lay of the occupant. The asymmetric quilt is unique to the BoneFire. The hammock features a double layer design. The hammock is designed with asymmetric bug netting and matching tie-outs to help hold open the bug net and hammock. On the head end, a convenient peak bag is attached where you can store small odds-and-ends. The zipper is only on one side, and purposely shorter in length to reduce weight. 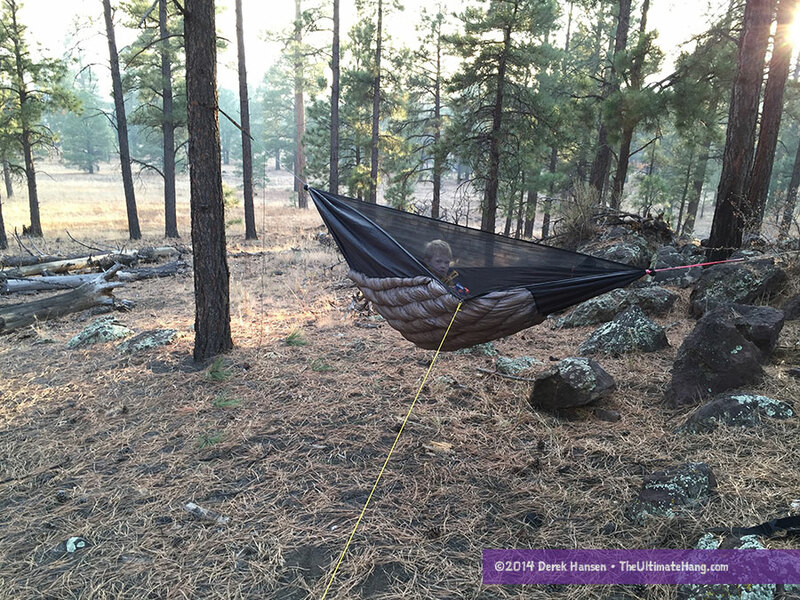 One of Jeremy’s goals is to create a relatively light hammock that focuses on the quick set-up for those who are looking to go light and fast while backpacking. Who Is This Hammock For? Bonefire’s goal is to appeal to the lightweight crowd, by making a hammock that cuts out any extra assembly or set-up and simplify the kit. The idea is to simplify the overall setup and reduce pitching time. This hammock is ideal for seasoned hangers who favor simplicity and speed. Insulated hammocks have been played with for years. They are a niche product to be sure, but there are some advantages that make them more than just curiosities. One downside to traditional under quilts (or even pads for that matter), is that they do not always perfectly seal around the hammock, letting in cool drafts that can cause cold spots. Insulated hammocks solve this by completely sealing up every edge. This is a no-nonsense setup. Insulated hammocks also set up a sort of “base layer” of warmth. While there are some locations where you can sleep without any insulation, I’ve yet to camp in the northern hemisphere (even in Hawaii and Arizona!) where I didn’t need some insulation, sometimes just in the coldest parts of the night. Having a hammock with a base of insulation is a great starting point for most adventures. 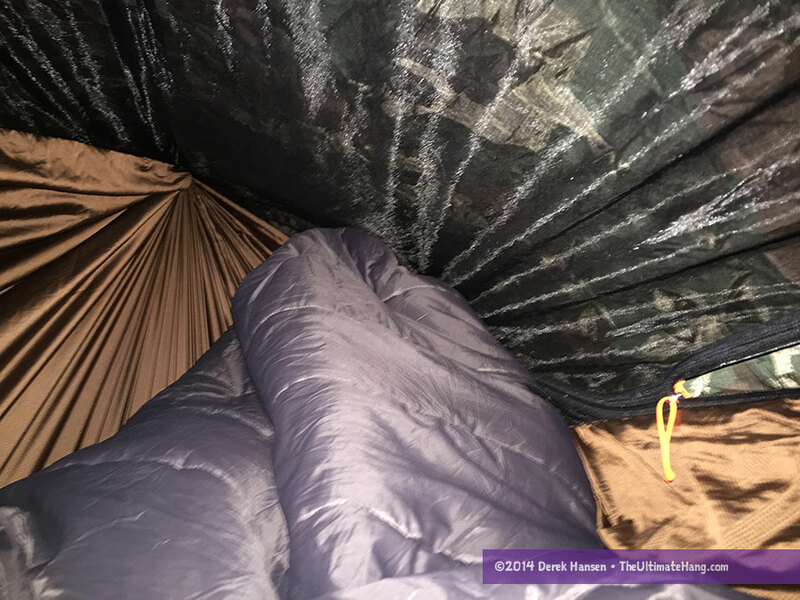 A disadvantage to the BoneFire design is there is no way to vent the under quilt, so it becomes a little more limited in usage, particularly if you overheat. An obvious disadvantage to some folks is that you become married to hammock and quilt. Hammocks by their very nature are modular systems, which allows you to mix-and-match to you hearts content. However, too much choice can often be crippling for some people, and insulated hammocks, like the BoneFire, certainly make the choice easier in may respects. I’m not really concerned about convincing anyone for or against insulated hammocks. I think this hammock would appeal to the “light-and-fast” crowd who are always on the lookout for systems integration improvements and advantages. 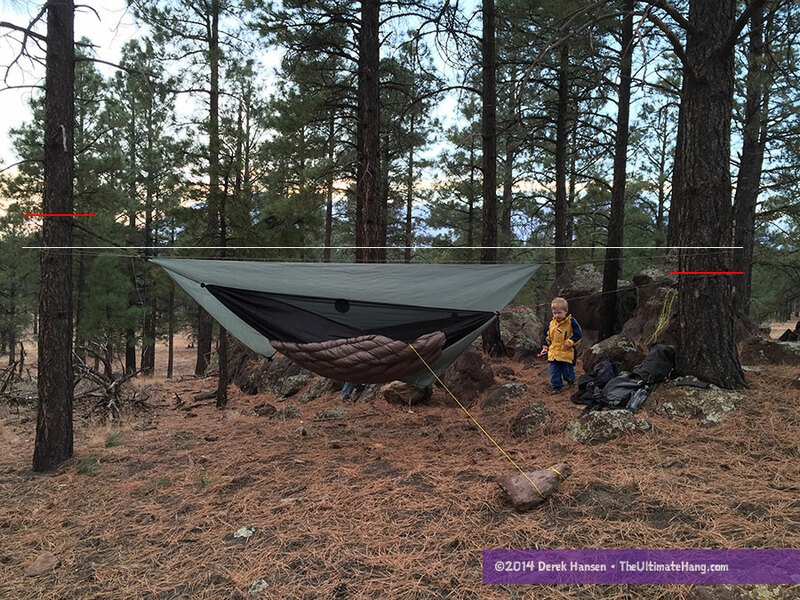 Generally speaking, most hammocks can be set up level and centered between the anchor points. The BoneFire hammock, in contrast needs to be set up so that the head end is a little lower than the foot end so that your torso properly matches where the insulation is sewn. A lot of hangers prefer having the foot end a little higher by choice, which also prevents you from sliding much. This off-balance set-up can take a little time to figure out on your first try, but it does make the overall lay much better in the BoneFire hammock. The insulation also provides more coverage in this adjusted hang, especially under your legs and feet. While I only had this hammock for a few days for actual testing, I was able to get into some pretty cold weather. The coldest I was able to hang in this hammock was around 15°F (-10°C) without any additional insulation underneath, except for my legs where I used a pad. I used a weather shield (a tube of fabric) that also helped eliminate any wind or air circulation. My backyard hang wasn’t ideal because I was using a stand, which makes it a little challenging to hang the head end lower than the foot (this accounts for the insulation not fully covering my legs). The overall lay of the hammock was good, but the prototype I had was a little smaller than the production models that Jeremy is releasing. The interior felt more like a Hennessy, but the final versions should be larger. I like the concept of insulated hammocks, but I realize they are not designed for everyone. Jeremy is the first to admit that this hammock is designed for serious hangers who are looking for specific performance outcomes. I appreciate that Jeremy knows who he is marketing to; not everyone is looking for this degree of speciality. This, but with a zipper, would be nice. That way you could ventilate a bit, and swap underquilts to match the season. Regardless, I like the idea. I also like that it is longer than normal production hammocks. We like to keep things simple, but if you have an idea that you want tried, let us know. I love the idea of an integrated underquilt. I think it’s perfect, no messing around. As I was reading Derek’s post it occurred to me that for the investment it would be nice to have a way to swap out the quilt between trips, allowing the ability to buy a lighter or heavier secondary underquilt that would zip onto your hammock. I suppose that it would make it tougher to keep a connection over the width of the hammock. An interesting idea. Sounds like some innovation around the corner. That would be difficult as the outer layer of the hammock is the inner layer of the quilt. We might be able to drum something up like that, but I’m not sure if a zipper would work. You’ve given me something to think about. You could always add an underquilt to push into lower temps. It strikes me that the zipper based modularity would work contrary to one spoken and one market/customer goal. The spoken goal is weight. You would be upping the weight with the zipper system. Given how focused on weight reduction many ultra-light backpackers can be, I’m not sure whether the target market will embrace such a solution. The second challenge is similar. A zipper based modular system brings a very high probability of system lock, i.e. you can only use gear within this system. In the tech world, the analogy is Mac vs PC Some people are okay with that, others, not so much. Before venturing into producing such a system, it would behoove a maker to consider whether THIS market can support it, AND whether or not the maker can cover enough bases to provide enough options. Which is another reason that we have decided to make only minor changes to the system, but we do not plan to become modular beyond the current design. Expect the final design to be reviewed soon. We will not be offering a quilt that is removable. I live in Sweden where it’s pretty cold all year around and I think that you would need an underquilt even during most summer hangs. I’m new to hammocking and I just started this winter. I really really like the idea of an insulated hammock and I’m pretty sure that I,m going to get get either the bonefire or the sheltowee boone 20. Since you’ve done a review of both these hammocks, or at least the sheltowee 40, http://theultimatehang.com/2014/04/sheltowee-hammock-review, I wonder if you can shed some light and thoghts regarding lay/sleeping comfort in theese hammocks? I like the integrated bugnet in the bonefire but on the other hand a bugnet would only be a requirement during late spring and summer, in sweden. Rest of the year it might be nice not having a bugnet!? From a pricing perspective the sheltowee seems to offer most bang for the buck. 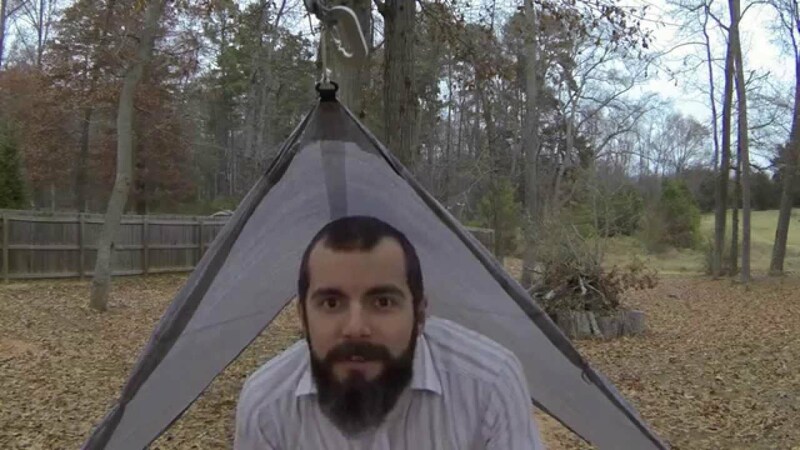 $377 for hammock, bugnet and overcover. The bonefire has an edge when it comes to weight 822g vs 1121g. But I think the most important thing is the lay/sleep comfort and as far as I know you’re the only person who has used them both! The Sheltowee has an add-on bug net you could use, along with a winter shell that also goes over the top. I’ve tested the winter cover and it works well. 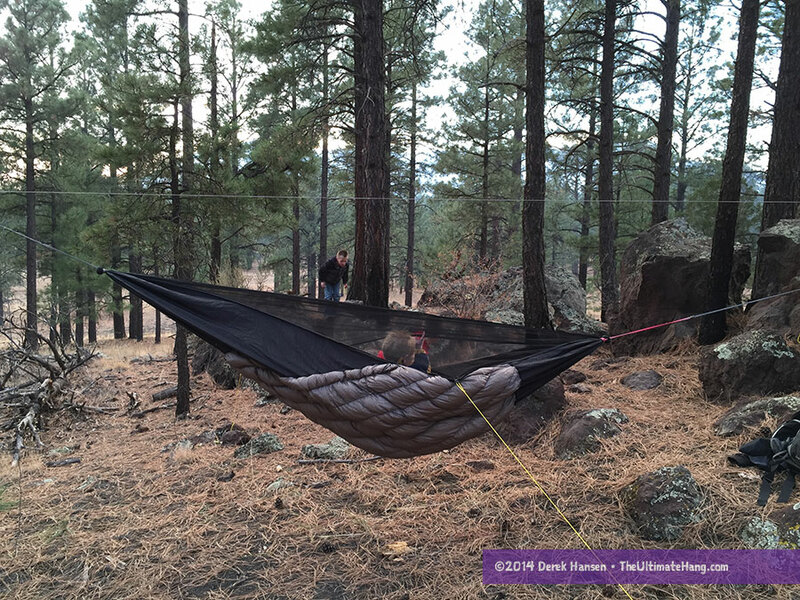 The Bonefire is really a purpose-made hammock that, as you say, is driving at getting the features very streamlined. There are some trade-offs. The Sheltowee has an open-hammock design so you are not restricted on the lay direction or style as you are in the Bonefire. Considering your situation, I would lean toward the Sheltwoee. The lay is very comfortable; one of the best I’ve seen across many hammock designs, not just the Bonefire. Thank you! I’ll contact Alex at Sheltowee to discuss what he can offer me!